Rodrigo Duterte is very much in the news these days. There is a strong clamour for him to run as President of the Philippines in the 2016 national elections. But how well do you know Rodrigo Duterte aside from being the Mayor of Davao City? He is a lawyer. He is an alumnus of San Beda College in Manila where he obtained his law degree in 1972. He took the Bar Exam the same year and passed. He is a former Prosecutor or popularly known as Fiscal. A Fiscal is a lawyer who conducts the case against a defendant in a criminal court. He was married twice. His first marriage was annulled. He was married the first time to Elizabeth Abellana Zimmerman, a flight stewardess who hails from Davao City of German American descent. Elizabeth was married to the Mayor for 27 years. Elizabeth Abellana Zimmerman is a product of the Catholic Educational System. She attended Ateneo de Davao. She has prominent mestiza features; her grandfather hailed from Germany but migrated to the US. She ran for councilor as Independent in Davao City in 2001 but failed to be elected. He is in favor of the restoration of the death penalty. He subscribed to the idea that death penalty is an effective deterrent to crimes. Death penalty was abolished in 2006. He favors a federal form of government. Federalism is a type of government in which power is divided between a central national government and local governments, thereby enhancing the autonomy of local government units. Rodrigo Duterte belongs to PDP-Laban and Hugpong sa Tawong Lungsod, which he formed as a local political group in the 1990s. It is a registered political party. 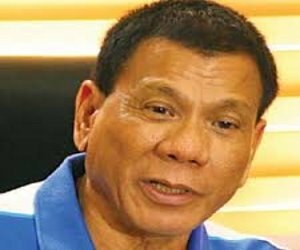 Rodrigo Duterte’s father, Vicente Duterte was a Nacionalista Party (NP) governor of the undivided Davao province during the 1950’s to 1960’s. Rudy Duterte as he is sometimes called practices a frugal lifestyle. He even drives an old Volkswagen vehicle aside from the official government pickup which he use. He sometimes drives a taxi about midnight to prowl the nooks and cranny of Davao City hunting for criminals and when there is none picks up helpless senior citizens and women with children stranded in flood and deliver them safely to their homes. assistance from the police, fire department or ambulance. Would you be able to let presumptive President Duterte know my proposal, i.e. that he first aim to ensure that all Filipinos have 3 meals a day? Thank you for your kind attention. Wow. How embarrassing. So, the guy calls the Pope a son of a whore, jokes about a lay missionary from Australia being raped in a Manila prison, boasts that he must use Viagra, in order to have an erection, and threatens to have poor drug dealers and petty criminals killed by the police. What an old bag of fart. And you people elected him? Ha-ha-hah! And yet our country is about to leave the Third World Category because of his efforts. Don’t be a dumb yellowtard. Ewww! Majority did but not all…. That is how desperately desperate we had become!